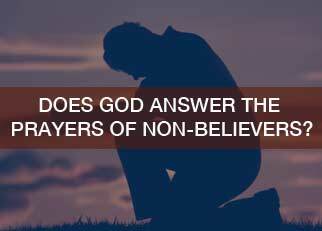 How do we know if God does answer the prayers of non-believers? This can be a loaded question. question, we must understand the exact question we are trying to answer. We do not mean a general speaking towards God. We do not mean a personal request for salvation. We mean someone who does not believe in Christ or has not heard of Christ. Why are we not talking about prayer as a personal request for salvation? righteousness, and with the mouth one confesses, resulting in salvation. first and is the only requisite to salvation. realities are working in tandem with each other, not that one must happen before the other. Understanding if God answers the prayers of non-believers. does his will, he listens to this one. understanding of the Scriptures to prove that Jesus was who He claimed to be. will concede to their every request. that you may spend it on your pleasures. what He denies, and what He leaves on the table for later. of believers. The important question to ask is this: Is the prayer within the will of God?